Wherever I am, I am what is missing. That pic to the left? 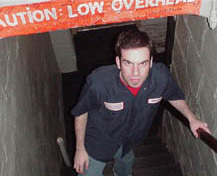 Taken in February of 2003, as my 25-year-old self was embarking on what would be a 6-and-a-half-year run as midday host at the legendary 104.1 WBCN. I was the last full-time DJ hired by Oedipus and the last to host middays at the now-defunct, 50,000-watt juggernaut. I had a lot more hair back then. Who am I? I'm a kid from a lovely, tree-dotted 'hood called Greenwood. Greenwood is in Wakefield, Massachusetts. People from Wakefield who didn't grow up in Greenwood wonder why people who did grow up in Greenwood say they're from Greenwood and not from Wakefield. Some of them even get upset about it. I'm also a husband. And a father. And a Christian. And I struggle daily with all three. What do I do? I talk on the radio. I've worked in Boston, Denver, Salt Lake City, and Albuquerque (the wetsuit helped keep my skin moist and dewy in the dry desert climate). I've been on the air at all times of the day and all days of the week. I've been a Music Director and I've programmed and hosted free-form new music programs. Recently, I've expanded my repertoire to include Social Media (I deliver a mean seminar; hit me up), Commercial Production, Operations, Mentoring, and Teaching. More? You can hear me weekdays from 2pm to 6pm on RadioBDC. I wear a size 12 Chuck Taylor (black and high, preferably). I hike and run, occasionally. I teach Sunday School music. My favorite band of all-time is Guided By Voices. My favorite thing to eat is a shiny, red apple. And yes, that's yours truly rockin' the mullet. Fear it.